The fugitive drug lord Joaquín "El Chapo" Guzmán has finally been recaptured after escaping from a Mexican prison. He may end up serving time in a notorious US "supermax" facility. To get an idea of how the elusive and monied drug trafficker operates, it helps to look at an indictment filed against him in a federal court in Florida in 2010. It is one of several indictments he faces in the US. Guzmán and his Sinaloa cartel controlled as much as 35% of the cocaine produced in Colombia, and the Florida indictment links Guzmán to Colombian traffickers known as the Cifuentes Villa clan. It alleges they conspired to manufacture cocaine, ship it through Latin America, and distribute it in the US. Guzmán's partnership with the Cifuentes Villa clan likely allowed his cartel to extend its influence over Colombian cocaine production and expand its control over global cocaine trafficking - a billion-dollar industry. The indictment names Jorge Milton Cifuentes Villa, the purported leader of the group, his brother, Hildebrando, and his sister, Dolly, as Guzmán's coconspirators. Jorge Cifuentes is "allegedly responsible for financing and coordinating multi-ton cocaine shipments via speedboats, fishing vessels, and airplanes to the United States via Ecuador and Mexico," according to an information sheet put out by the State Department in 2011. "Since 2008, he most likely has obtained and imported over 31,000 kilograms [68,343 pounds] of cocaine to the United States, and is purportedly the primary source of … cocaine for the Sinaloa Cartel in Mexico," the information sheet noted. The Cifuentes Villa clan was one of the most prominent groups among Colombian traffickers and had been involved in trafficking for more than 20 years, according to Insight Crime. Jorge Cifuentes posed as a businessman working in Mexico, Panama, and Ecuador, and he had a least six businesses in Mexico set up to launder money, according to a review of public registries done by Mexico City-based daily Proceso in 2011. With his sister, Dolly, Jorge Cifuentes allegedly took over the clan's operations when their brother, Francisco, was killed in 2007, Insight Crime notes. Francisco was killed after what Colombian newspaper El Espectador called "disagreements" with ex-paramilitary leader Diego Fernando Murillo, a.k.a. Don Berna, who may have played a role in the operation that killed Colombian drug lord Pablo Escobar. The clan worked with Escobar's Medellin cartel (Jorge's brother, Francisco, reportedly worked as a pilot for Escobar), and then for the Oficina de Envigado, which assumed much of Medellin cartel's operations after Escobar's death in 1993. The Cifuentes Villas also worked with the Norte del Valle cartel, which took over the Cali cartel's operations in the late 1990s. The family also partnered with the paramilitary group known as the United Self-Defense Forces of Colombia (AUC), a right-wing paramilitary group that operated in Colombia from the late 1990s until the late 2000s. Despite the charges in Florida, none of the members of Cifuentes Villa clan who have been caught have actually been tried there. Jorge Cifuentes was arrested in Venezuela in 2012 and extradited to the US in late 2013. His trial in New York has been ongoing since 2014. Dolly Cifuentes, who reportedly had an affair with the brother of former Colombian President Alvaro Uribe, was arrested in 2011 and extradited to the US in 2012. She then pleaded guilty to one charge in late 2013. Hildebrando, aka "Alex," captured in Mexico in 2014 while allegedly working with Guzmán's cartel, reportedly arrived in New York in January to face trial in the US. 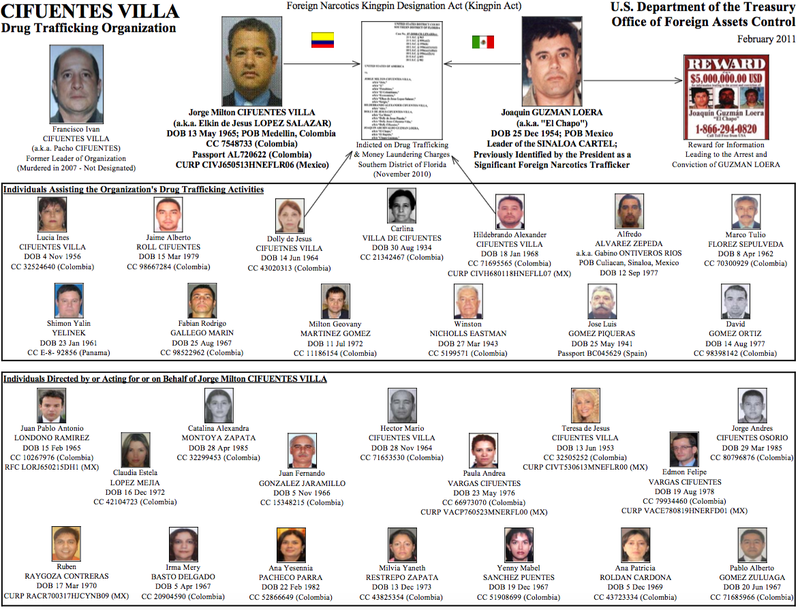 The connection between the Sinaloa cartel and the Cifuentes Villa clan seems to be but one facet of the Mexican cartel's operations in Colombia, which produces 90% of the cocaine found in the US. Drugs are shipped by fastboat from Colombia, primarily to Guatemala's Puerto Quetzal, which handles almost all of the cocaine coming out of Colombia. The Mexico/Central America corridor handles 87% of the cocaine that reaches the US, according to the DEA. While the 2010 indictment from Florida sheds light on Guzmán's ties to Colombian cocaine, it does little to clear up where the kingpin will face trial in the US if he's extradited from Mexico. US attorneys in six states, including New York, Florida, and California, have indictments pending against Guzmán. The San Diego district office, which first brought charges against him in 1996; the Chicago district, which has more available witnesses, including Vicente Niebla-Zambada, the son of a Sinaloa cartel leader; and the Brooklyn office, which was led by current US Attorney General Loretta Lynch when it filed charges against Guzmán, are the venues where the drug lord will likely end up, according to the Los Angeles Times. The Justice Department "will pick the ... case with the highest chance of success," Carl Pike, a former top DEA official, told the LA Times. As much as US prosecutors may want to try him, and as anxious as Mexican officials are to be rid of him, the "reality is extradition takes a long time," David Shirk, a professor at the University of San Diego and director of the school's Justice in Mexico program, told Business Insider in the hours after Guzmán was recaptured on January 8. "It's a very complicated process ... especially cases like this, where the individual in question has a lot of resources to challenge extradition in court." Voter confronts Donald Trump: Could my daughters 'look up to a President Trump as a role model'? 6Voter confronts Donald Trump: Could my daughters 'look up to a President Trump as a role model'?